Rediff.com » Getahead » Is the Thomson B9 40-inch TV value for money? A good price. Slim bezels. The Aptoide app store. But is it enough, asks Aparna Banerjea. 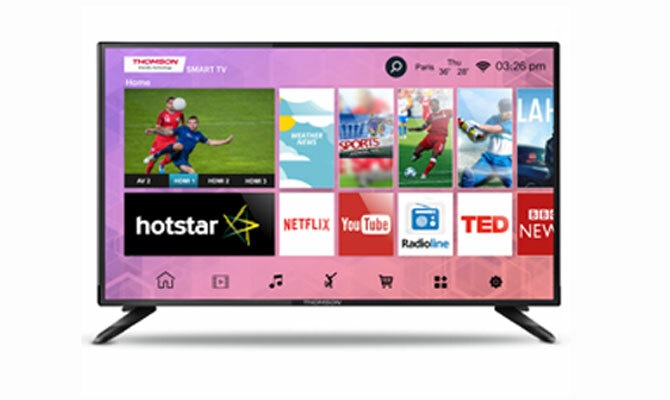 Thomson recently launched a range of smart TVs in India at a time smart technology from both big and emerging brands has flooded the market. 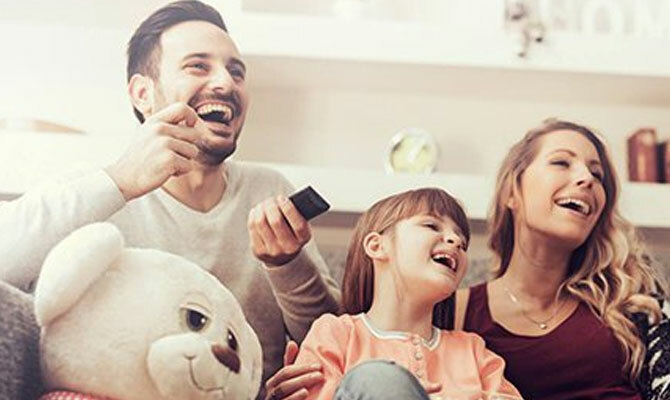 In an exclusive licensing agreement with Super Plastronics, the French brand launched its 43 UHD (ultra-high definition) 4K, 40 smart and 32 smart TVs in India, which will be available on Flipkart. The Thomson LED Smart TV B9 is a perfect addition to progressive technology. Priced at a mere ₹19,999 on Flipkart, the brand is capable of taking on similar products of rival companies such as Daiwa and Mi TV. Its enticing price apart, the TV has its pros and cons. The LED screen looks modern with minimal bezels. Thomson has taken the middle ground in design -- it is slim but the smart TV is all plastic and therefore lacks a premium look. The back and left of the TV house all the input ports and connectors. The list is standard -- three HDMI ports, two USB 2.0 ports, a VGA port, a Rj45 port for internet connectivity, et al. On the right, slightly at the back of the TV, sit the standard functioning buttons such as volume control and menu. The ports are easy to reach if the TV is placed on a stand, but less so if mounted on a wall. The LED has a simple, yet appealing clutter-free design. The unit I reviewed had a faulty volume button. The buttons betrayed cheap plastic. The product also comes with a new user interface Smart Wall feature that offers a bundle of applications on TV, worldwide content, temperature display and much more. It has dedicated icons for different apps and programmes. The TV comes with full HD, 1920 x 1080 pixels supporting almost all types of video formats. Its 4K experience was on a par with rivals such as the 50-inch Daiwa. However, its picture quality seemed inadequate in comparison to other smart TVs in this price range. Its muted display was unsuited for a dark or dim-lit shot. This was also an issue while playing games. The 40-inch FHD Smart TV does not boast anything new in terms of software. The CPU is based on ARM Cortex CA53 64-bit and is coupled with a Multi Core Mali-450MP3 x 5 and 1 GB DDR3 RAM and 8 GB internal memory. The OS you get is Android Lolipop 5.1.1. The icons are large and placed neatly for easy navigation. While you can browse through various menus with ease, the hardware lags frequently. Also, the memory falls short if you want to install some streaming apps instead of the pre-installed ones. The viewing experience is marred by lags while switching from one app to another. The TV has built-in Wi-Fi and pre-installed apps such as Netflix and YouTube. It also comes with the Aptoide app store, but more apps increase the lag period. Finally, the remote control is a big disappointment. Apart from its plastic feel and touch, the buttons were often unresponsive. There were hardly any shortcut buttons, nor was there a mute button. The free-edge 20W speakers with surround sound technology seemed adequate at average volumes, when listening to songs at leisure. But a lack of bass and over-enhanced treble in the speakers became apparent after a while. If you want a true giant screen experience, I would suggest a dedicated 5.1 channel home theatre. Yes, that's a TV. The world's thinnest TV! Totally cool things we saw at the LG Signature Series launch!